Do you need help cutting down a troublesome hedge in Harlington? Or getting a driveway gritted in Toddington? Maybe your school's playing fields need their grass cutting, or your business' fences need repairing. 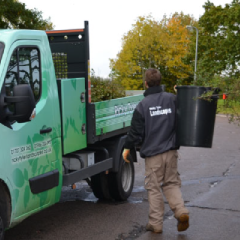 Whatever commercial landscaping, grounds maintenance or garden maintenance problem you have in or around Flitwick, Bedfordshire, Ricky Tyler Landscaping can resolve it. As specialists in these areas, we can provide a wide range of services tailored to the needs of our customers. For instance, if you run a business in Shillington, our commercial landscaping groundkeepers can perform many different tasks for you including weed and moss control, turf maintenance, tree surgery and flower bed care. Equally, wherever your residential home is, from Stewartby to Sundon and Woburn Sands to Meppershall, we can provide specialist lawn care and turfing as well as compost disposal, patio refurbishment and many other forms of garden maintenance. All of this will be provided at low rates and performed on time to high standards. Not only that, but we come prepared with stakes, feeds and many other types of equipment and tools so that if we spot any unacknowledged problems in your garden that need addressing, we can do so there and then. In order to ensure we can provide these services to you at a time of your convenience, we also offer a range of schedules including weekly, fortnightly and monthly visits by our team. You can pick a day and time that works best for you, regardless of where you live in Flitwick, Bedfordshire or nearby. As well as that, to give you the assurance that you'll be able to recognise us, we travel in vans bearing our trademark and wear professional uniforms when carrying out the work. All team members are also CRB-checked to ensure their backgrounds are known to us. Alongside that, we make sure everyone is covered by all necessary policies, from insurance to health and safety. 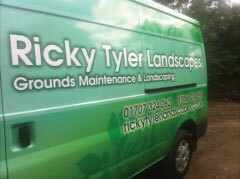 Ricky Tyler Landscapes can provide gardening and grounds maintenance services including Flitwick Grounds Maintenance covering Flitwick, Bedfordshire .